This Campanile is located in Argenteuil, 9 km north of Paris. It offers air-conditioned guest rooms, each with a private bathroom, Canal+ TV and free Wi-Fi internet. Guests of the Campanile Argenteuil can relax with a free newspaper in the hotel's lounge or library. A buffet breakfast is also available. The Campanile?s restaurant serves traditional family-style cuisine and a desert and cheese buffet. Guests can also enjoy the hotel's garden and terrace. Val d'Argenteuil RER Train Station is 2 km from the Campanile Argenteuil and guests can access Roissy-Charles de Gaulle airport in 25 minutes by car. 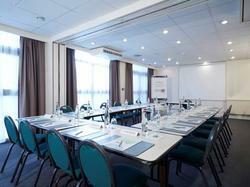 - Take the Porte Maillot exit off the ring road. - Head towards La Défense. - Then go towards Cergy-Pontoise via the A86 motorway. - Turn left at the second traffic light. - And then take the first street on your right hand-side. - Take the A86 motorway towards Nanterre. - Then the A15 motorway towards Cergy. - Take the exit signposted Argenteuil Centre. - Cross the Seine River, then turn left and carry on. - Take the A86 motorway towards Cergy. - Take the exit signposted Argenteuil Val-Notre-Dame. - Turn left at the second traffic light and take the first street on your right hand-side after the Seine. Val d'Argenteuil train station (RER) is 2 km away. Roissy-Charles de Gaulle airport is 21 km away. Check in must be before 23:00. If you cannot change your time of arrival, please contact the hotel before 23:00 local time, because the hotel has the right to resell your room after this time. These air-conditioned rooms have cable TV and an en suite bathroom. They are decorated in neutral tones.